A tomato allergy can be a difficult allergy to manage, considering how many recipes use tomatoes, such as pizza, spaghetti, and lasagna. And who doesn’t love a grilled cheese and hot bowl of tomato soup on a cold day? Those with a tomato food allergy, that’s who. Do You Have a Tomato Allergy? Reactions to tomatoes are uncommon, but they do happen. Symptoms can manifest themselves soon after ingestion but sometimes it can take up to 72 hours before they show up, in which case it’s likely tomato intolerance rather than an allergy. The difference is a matter of time and severity. Tomato allergy symptoms can appear quickly, taking the form of hives, swelling of the throat, an itchy throat, and puffy eyes, whereas intolerance symptoms can take a while to develop—an hour, a few days, or even a week is not unheard of according to some naturopathic doctors. And because the symptoms can take so long to appear, they are often dismissed or mistaken for something else. Many people assume that allergic reactions or intolerances will result in immediate signs and symptoms, because that’s likely because they are associating it with the worst of all allergy symptoms, anaphylaxis, which is quick and unmistakable. Tomato intolerance will likely never be life-threatening, whereas an allergy certainly can be. If you suspect a true allergy, visit your doctor to have proper testing done and to determine if you should carry an Epi-Pen. If your face swells, your throat closes up, eyes get puffy and close up, and you have trouble breathing, then get emergency medical help immediately. These reactions could be life-threatening, as you are likely experiencing anaphylaxis. Tomato allergy eczema is also a common allergic reaction that comes from handling tomatoes. 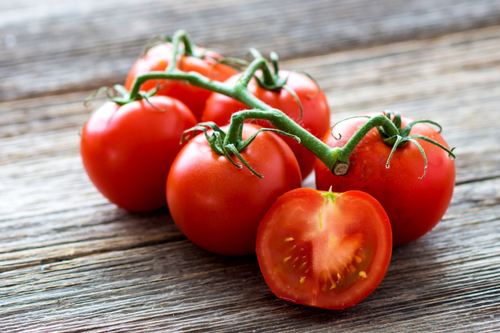 If intense itching and redness occurs when you cut tomatoes (most likely because of the juices), then either wear gloves or don’t handle tomatoes at all, as this likely indicates that you have a raw tomato allergy. Can You Reduce a Tomato Allergy Naturally? While allergies do sometimes resolve on their own, in general a tomato allergy cannot be removed; it’s something that you have to learn to manage, and there are ways to do this naturally*. Apple cider vinegar is a miracle for many ailments. Drink a shot of apple cider vinegar every day on its own or in water or juice to help build your body’s immunity; this will also translate into helping your body better manage allergies. This is a natural bioflavonoid and potent antioxidant can help stabilize mast cells, which will prevent them from releasing histamine. It’s best to start taking this supplement about four to six weeks before allergy season starts. Nettle leaf or nettle tea is another natural antihistamine. It can be made into an anti-allergy tea (with other herbs such as peppermint or red raspberry leaf) and it can be made into a tincture, but the most effective relief comes from taking capsules of dried nettle leaves. Fixing gut flora goes a long way toward managing allergies. Using a probiotic daily will balance the gut’s environment and that will translate into fewer and less severe allergic reactions down the road. Wear gloves when handling tomatoes. If you didn’t wear gloves, then be sure to wash your hands thoroughly with soap and water. Don’t eat foods with tomatoes in them. Read the label to make sure the product in question doesn’t have tomato powder, a common flavoring in many snack foods. Use separate cutting boards and knives for tomatoes. If you’re inclined to go the medical route, then you can try over-the-counter antihistamines to help control symptoms. You may also be wondering about allergy shots as a method of prevention, but these are meant for things like hay fever, and they don’t work for food allergies. The best thing you can do to prevent the symptoms of tomato allergies is simply to avoid tomatoes or take the above steps to reduce your contact with them. Another thing to consider is cross-reactivity. If you’re allergic to tomatoes, then you may also be allergic to other plants from the nightshade family, such as potatoes, peppers (and hot peppers), eggplants, and even tobacco. It may be wise to stay away from these if you’re experiencing any tomato allergy cross-reactivity, but it’s always best to check with your doctor first. The only real way to test for a tomato allergy is to visit a doctor (specifically, an allergist) who will do a skin prick test. In this test, your skin is scratched with a small needle containing some of the allergen; if the scratched skin reacts, there is an allergy. If you have any of the following symptoms, seek medical attention right away. “Tomato Allergy,” Catherine Davies web site; http://catherinedavies.com/tomato-allergy, last accessed April 5, 2016. “Do You Have A Tomato Allergy or Intolerance?” Yorktest Laboratories web site; http://www.yorktest.com/blog/do-you-have-a-tomato-allergy-or-intolerance/, last accessed April 5, 2016. “Tomato Allergy: Symptoms & Treatments,” Med-Health web site; http://www.med-health.net/Tomato-Allergy.html, last accessed April 5, 2016. “7 Natural Remedies for Allergy Relief,” Wellness Mama web site; http://wellnessmama.com/8370/allergy-relief-remedies/, last accessed April 5, 2016. “Allergy Shots (Immunotherapy),” American Academy of Allergy, Asthma & Immunology web site; https://www.aaaai.org/conditions-and-treatments/treatments/allergy-shots-(immunotherapy).aspx, last accessed April 5, 2016. “Treating a Food Allergy,” National Health Service web site, last reviewed April 25, 2014; http://www.nhs.uk/Conditions/food-allergy/Pages/Treatment.aspx, last accessed April 6, 2016.